Bob Carver is the winner of the Founder's Award from the Los Angeles and Orange County Audio Society, it was announced today by The Society. Congrats Bob! A living legend! Ain't that cool? I was researching something else actually and ran across that neat tidbit. I never knew he was from the Motor City! Fellow Michigander it's about time he is recognized as one of the, if not all time designers of audio gear. When people stop by my house, if they didn't know who he was.. They did by the time they left! I'm surprised I got the "scoop" on this!! Congratulations Bob! Well deserved and long overdue! That is really cool and a nice read! It's funny he mentions the I-Mag amplifier, I was just asking Bill Flannery about it but he's never heard of it, wonder if it will ever be produced? If I recall correctly there are a few pre production units in existence. There are a few people on this forum who have actually seen and heard them. I remember a interview, i think it might have at a carverfest that he talked about this I-Mag amp...i'll have to check youtube. I hope to be in attendance when he receives his award. nooshinjohn wrote: I hope to be in attendance when he receives his award. That'd be very cool to be there in attendance. Wish more of us could be there. If you can, please try to grab some pictures and post here please!! IIRC James and some of his family along with AngeloD have heard the I-Mag. 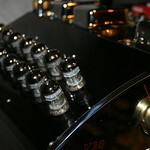 From what I 'remember' Bob says it is his best sounding SS amp and has the fewest parts. I should have asked him to bring one when I spoke with him yesterday.